In Ovid’s retelling of Virgil’s Aeneid, in Metamorphoses, Aeneas has just returned from the Underworld with the Sibyl of Cumae as his guide. Ovid then uses two of Ulysses’ men to narrate episodes from Homer’s Odyssey in flashback. The first is Achaemenides, who survived their encounter with Polyphemus. Aeneas sailed on from Cumae and reached the coast midway between Naples and Rome, at Caieta (Gaeta). There he went ashore, and Achaemenides, whom Aeneas had rescued from Sicily, happened across Macareus, another survivor of Ulysses’ crew who returned from the Trojan War. The meeting of these two veterans prompts Achaemenides to give a short account of the encounter between the Cyclops Polyphemus and Ulysses (Odysseus) and his men. The full story is not given here, but was familiar from the Odyssey. 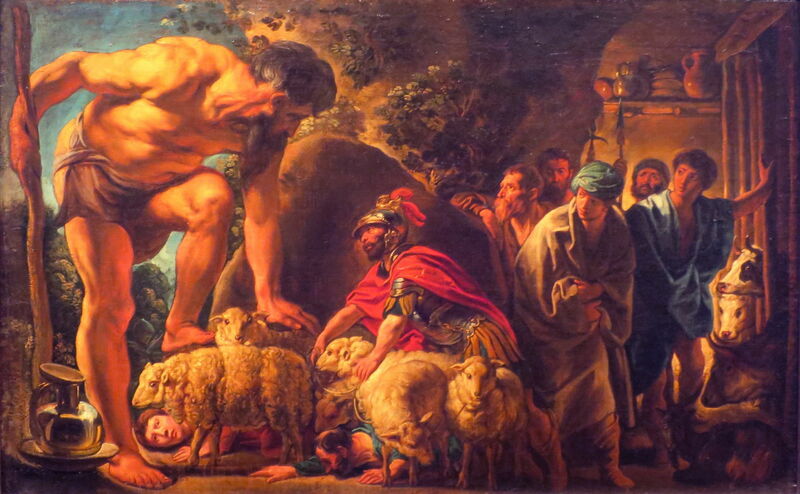 Polyphemus, a savage one-eyed man-eating giant, spent his days tending his flock of sheep. Polyphemus held Ulysses and his crew captive, then devoured several of them, so Ulysses got the Cyclops drunk in order to engineer their escape. Polyphemus asked Ulysses his name, and the latter replied Οὖτις (Outis, Greek for nobody). 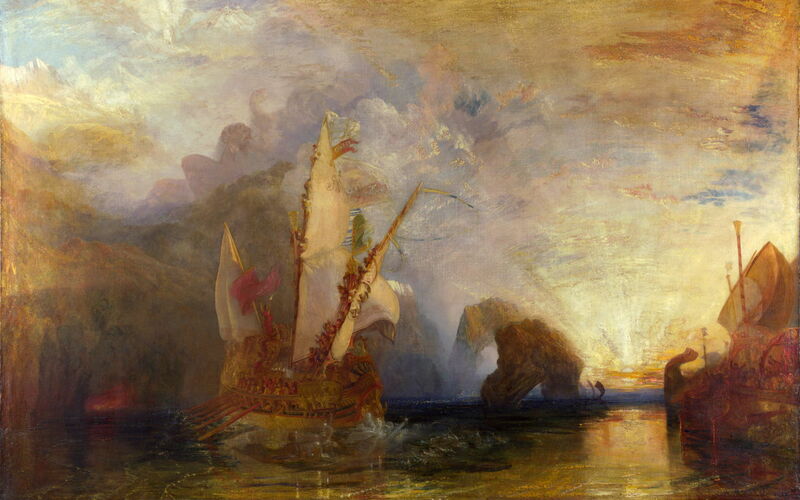 Once the giant had fallen into a stupor, Ulysses drove a hardened stake into the Cyclops’ one eye, blinding him. forgetting that I still was on the shore! awaiting my destruction I lost hope. down to the shore. My prayers prevailed on them. A Trojan ship took in and saved a Greek! This prompted Macareus to tell the story of his survival. One of the best-known episodes from Homer’s Odyssey, there are some superb paintings telling the story of Ulysses/Odysseus and Polyphemus, but none which makes any reference to Achaemenides, who may just be a narrative device created by Virgil to link his Aeneid with the Odyssey. Christoffer Wilhelm Eckersberg (1783–1853), Ulysses Fleeing the Cave of Polyphemus (1812), oil on canvas, 80 x 63.5 cm, Princeton University Art Museum, Princeton, NJ. Wikimedia Commons. 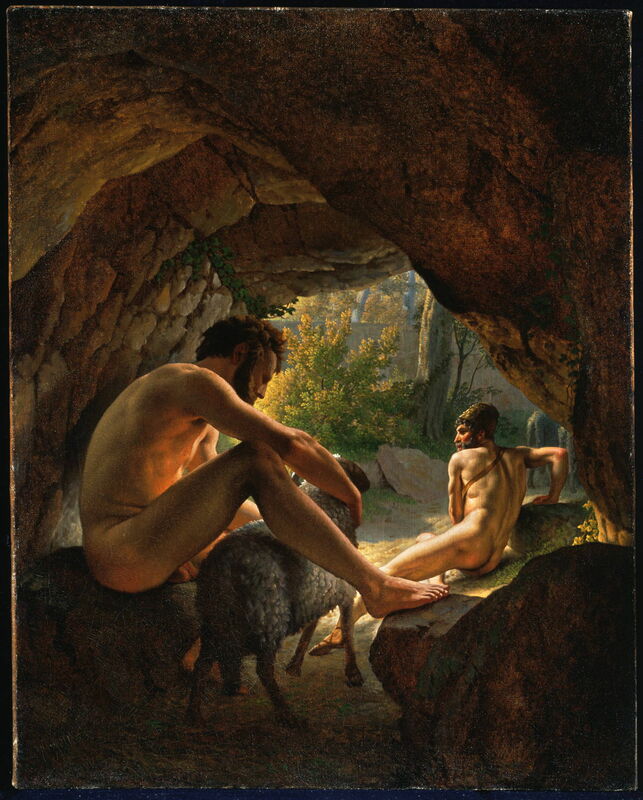 Christoffer Wilhelm Eckersberg’s Ulysses Fleeing the Cave of Polyphemus (1812) shows Ulysses about to make his way out of the Cyclops’ cave, as his captor strokes one of his sheep. With Polyphemus’ face turned away from the viewer, it is difficult to confirm that he has been blinded at this stage, though, making this painting quite hard to read. Jacob Jordaens (1593–1678), Odysseus in the Cave of Polyphemus (date not known), oil on canvas, 76 × 96 cm, Pushkin Museum Музей изобразительных искусств им. А.С. Пушкина, Moscow, Russia. Wikimedia Commons. Jacob Jordaens pictures the crew fastening themselves to the underside of the sheep as they prepare to escape, in his Odysseus in the Cave of Polyphemus, which was probably painted in about 1650. Again, the Cyclops is facing away from the viewer, and it is hard to be sure that this is taking place after his blinding. 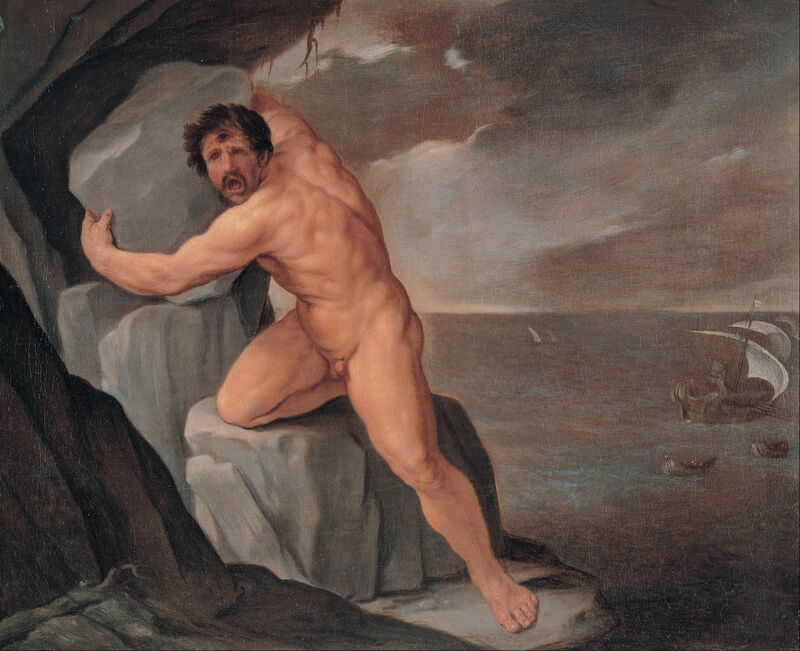 Given the difficulties in depicting the moment of escape from their captivity, most artists have opted to show Polyphemus hurling chunks of mountain at Ulysses and his crew. Guido Reni (1575–1642), Polyphemus (1639-40), oil on canvas, 52 x 63.5 cm, Musei Capitolini, Rome. Wikimedia Commons. Guido Reni’s account in his Polyphemus from 1639-40 is far clearer. The Cyclopean eye socket is now empty, where Ulysses had poked its single eye out. In the distance, Ulysses and his crew are making their way out to their ships in two smaller boats, in their haste to depart. In Reni’s simplicity comes great narrative strength. Arnold Böcklin’s Odysseus and Polyphemus (1896) shows Ulysses’ crew rowing frantically out to sea, through large waves, as Polyphemus prepares to hurl a huge rock at them from the shore. The detailed realism and tight composition make this one of Böcklin’s most dramatic and active paintings, and a vivid account. Annibale Carracci (1560–1609), The Cyclops Polyphemus (1595-1605), fresco, Palazzo Farnese, Rome. Image by Study Blue, via Wikimedia Commons. 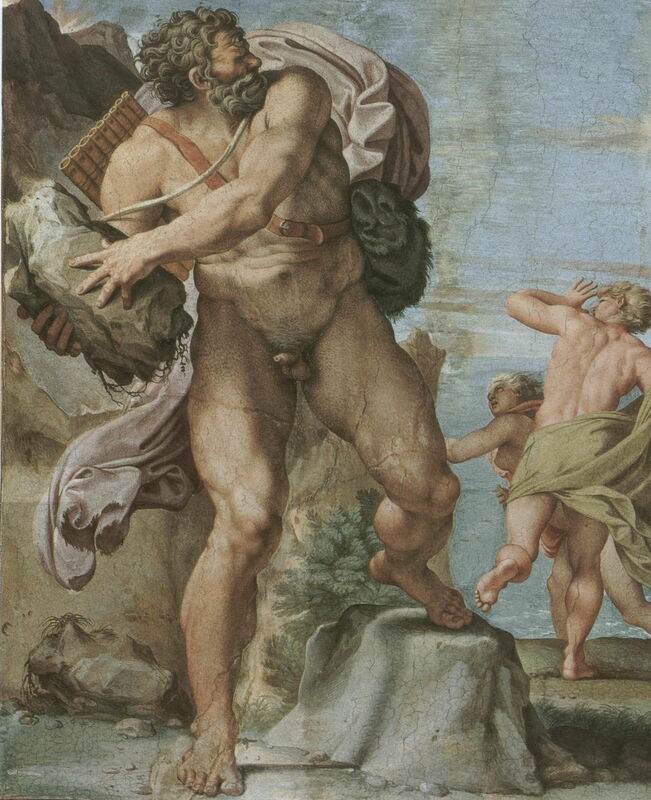 Annibale Carracci’s fresco of The Cyclops Polyphemus (1595-1605) in Rome’s Palazzo Farnese has sometimes been mistaken for showing this episode from the Odyssey. It actually shows, quite unambiguously, the earlier story in Metamorphoses, in which Polyphemus kills Galatea’s lover Acis. 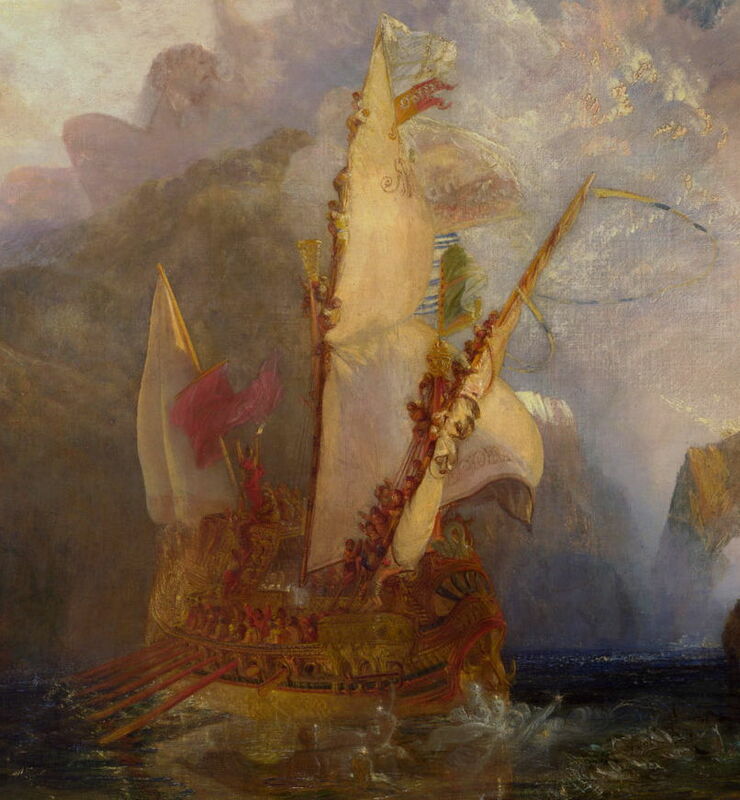 There is no evidence that the Cyclopean eye has been blinded, and closer examination of the fleeing figures shows that the more distant is a woman, Galatea. Posted in General, Language, Life, Painting and tagged Böcklin, Carracci, Eckersberg, Jordaens, Metamorphoses, myth, narrative, Ovid, painting, Reni, Turner. Bookmark the permalink. Supplemental Update for macOS High Sierra 10.13.3: is there more to it?